Join us during the month of April for the Certified Spring Sales Event at Bill Marsh Price Point in Traverse City! Includes a Limited Warranty up to 100k miles! Available 0.9% APR financing for up to 36 months – or – 3.9% APR financing up to 60 months for well-qualified buyers on these 2015-2018 model year Certified Pre-Owned vehicles: Chevrolet Equinox, Traverse and Silverado, Buick Encore and Enclave, GMC Terrain, Acadia and Sierra. Two BIG Auto Groups. One BIG Goal. Bill Marsh is joining forces with Serra for The Big Brothers Big Sisters Bowl for Kids' Sake Drive for 55 to raise $55k—reaching 55 more northern Michigan children in need. Make a difference in the life of a child by donating to the BIGs Drive for 55 today! The Ford F-150 sets the standard for light-duty full-size pickups with its lightweight yet high-strength aluminum-alloy cab and bed — the same high-grade 6000 series used in military and industrial applications. The results? Best-in-class payload and towing capability to haul all your summer toys! Smart from every angle. The most innovative technology out there is in here — with many of your must-have features coming standard. Beautifully designed inside and out for your comfort, convenience and safety, the 2019 Sonata is Hyundai's best one yet. Take your pick — Trailhawk or Limited! 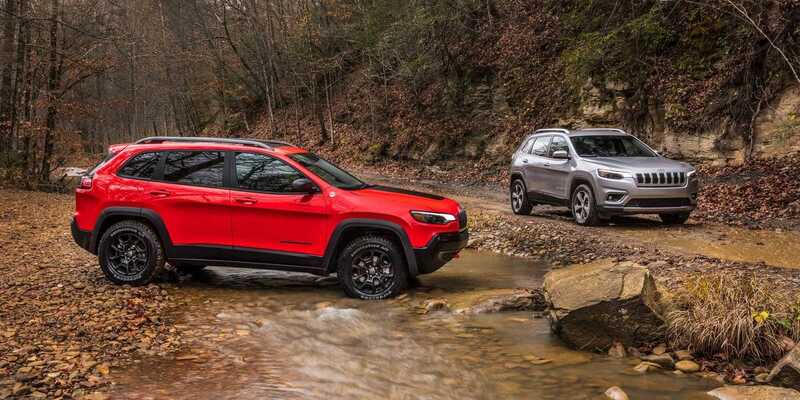 The 2019 Jeep® Cherokee takes the authenticity and craftsmanship of traditional Jeep Brand design and reimagines it for modern adventure. New, improved LED Headlamps and taillamps, coupled with new wheel designs and premium exterior convenience features, evolve Cherokee styling while holding true to its renowned roots. All wheel drive, remote start, backup camera and more — the Encore is sized to fit the way your life moves! Experience luxury with a purpose in the 2019 Encore small SUV with its available leather-appointed seating, QuietTuning™ technology and spacious, flexible interior. Do you know a service technician looking to grow at a fun company? We have a generous referral program in place to reward you for help! Chrysler Service is planning a major expansion and we're looking for talented technicians to help us grow. Drive the Hyundai IONIQ Hybrid for $249 a month and you'll enjoy 58 combined MPG! In addition to the impressive MPG, you'll find a clean aerodynamic shape, solid engineering, and advanced tech — plus, the EPA named the IONIQ America's Most Fuel Efficient Vehicle. Enroll today and keep your car well maintained. Your free MyCarFax account includes: timely service reminders, important safety and recall alerts, service history of your vehicle, and unlimited online storage of your service records. Copyright © 2019 Bill Marsh All rights reserved.